One of the things I like about slow projects like the Instorematic is the way it extends that window where you see the world through the filter of your project; the way that when you're working on / thinking about something you see echoes of that thing everywhere you go. Which makes you think again about what you're doing. For instance, we were at Drayton Manor Theme Park last week and wondered away from Thomas Land and all the scary, young people attractions to look at The Bryans Penny Slot Machine Museum. (I love the way Theme Parks always have these eccentric little corners). And saw this Automatic Postcard Vendor, a lovely machine which never made it into production. 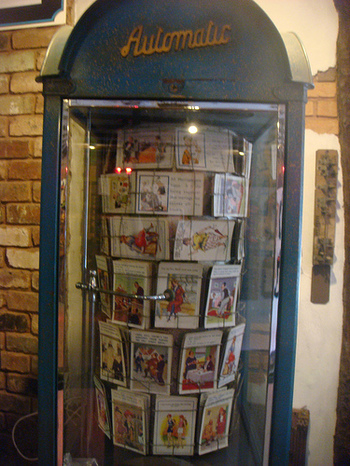 It hadn't really occurred to me before seeing this that the Instorematic is basically, an automatic postcard vendor (without the vending), so I did some searching and discovered that the very first vending machines were built to dispense postcards. So we don't just have a heritage of pointlessness, but also a noble one of mechanics. 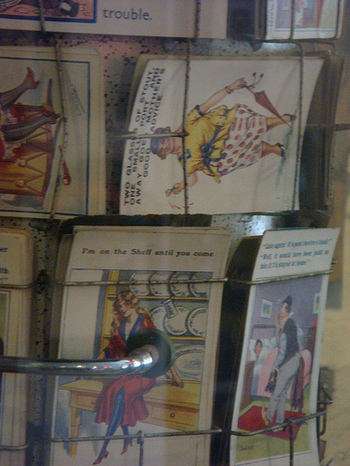 It also turns out that the way the machine dynamically creates a unique postcard on each occasion isn't so novel either. I found this patent from 1973 for a sort of combined photobooth/postcard machine which makes a postcard of you and yours standing in the view you've come to see. Surprised that didn't take off. Of course, we're not really doing the same thing, we're taking pictures from the flickr group. But, you know, it's interesting. Then, in other, but related news, Ed was kind enough to send me this video of a machine in a German restaurant which delivers food down a track rather like the machine will deliver postcards. You can see some common inspiration in the Emett breakfast machine from Chitty Chitty Bang Bang. emett breakfast machine from russelldavies on Vimeo. As Matt says, we're down to the difficult last 5%, but I suspect that the decisions we make here, to preserve the pointlessness, or to maximise efficiency, will really determine whether the thing's as properly playful as it should be. Really nice point Russell. When there are no constraints or timeframes the best ideas come out. You can take day to day stuff out of their normal contexts and try them in new ways. Like the guy who looked at a the rough bit of a sponge when washing up and thought it would make a great surface on the back of truck mud-flaps to reduce motorway spray. I bet he wasn't filling out utilisation sheets!